I am working on decorating my kitchen. Step one was my painted laminate countertops. Step two was hanging some shelves, which I'm going to show you later this week. Step three is hanging art. 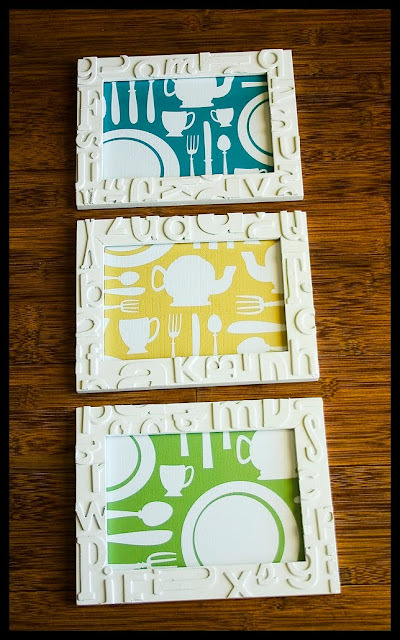 I've been having a blast making up art in my kitchen colors, which are teal, olive green and mustard yellow. This was one project I recently finished. I'm not sure where they are going to hang just yet (hence the pictures on my kitchen table), but I love the graphic feel of it. This is a fairly easy project that makes a big impact. I can't take credit for the idea. I saw a fabulous chair in a magazine that inspired the frames. Here are my frames before I started. I was thrilled to find three matching frames at Savers last time I went. They are from IKEA and were $.99 each. I don't think IKEA sells these anymore, but my guess is I probably didn't save all that much money, but I did save an hour trip, so there's that. Remove glass from frames. Put metal tabs or staples back into place. 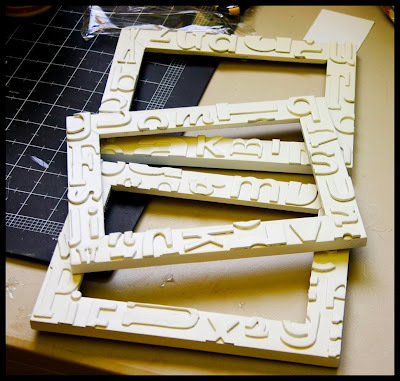 Step 2: Start gluing on chipboard letters. This is a great time to use up the last of some alphabets you already had. I think it would look awesome with numbers, as I always have numbers left over. 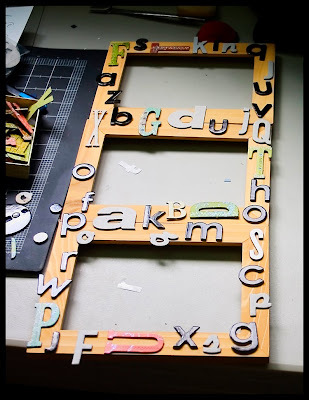 Chipboard alphas aren't too expensive, and I bet you could do three frames with one of a larger size, if you needed to buy them new. Step 3: Once your chipboard is all glued down, turn the frame over and trim with a craft knife. 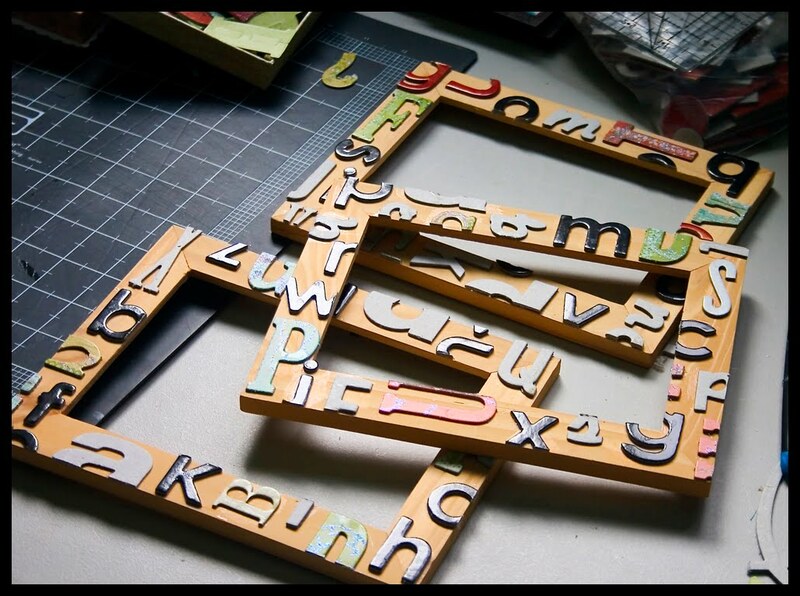 Do lots of shallow cuts for a cleaner cut, and it's less likely your alphabets pieces will come off. Step 4: Sand down the edges and the tops of any really glossy letters. 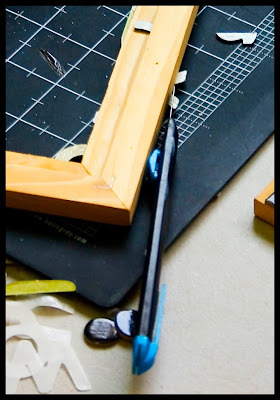 Also, make sure there aren't any glue drips or anything else that will mar the look of your finished piece. I freely admit I had some trouble with this. Don't look too closely. 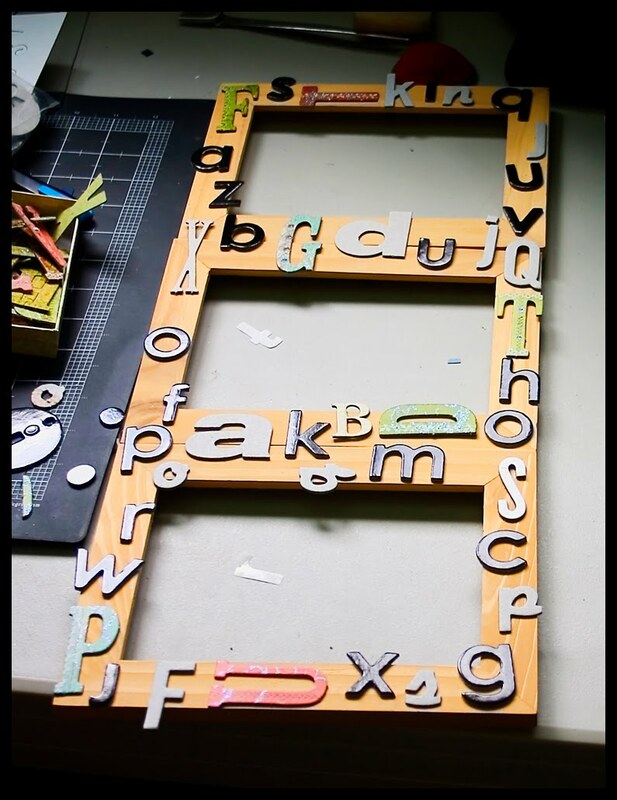 Step 5: Prime your frames, then do light coats of spray paint to cover the chipboard. Let dry between coats. 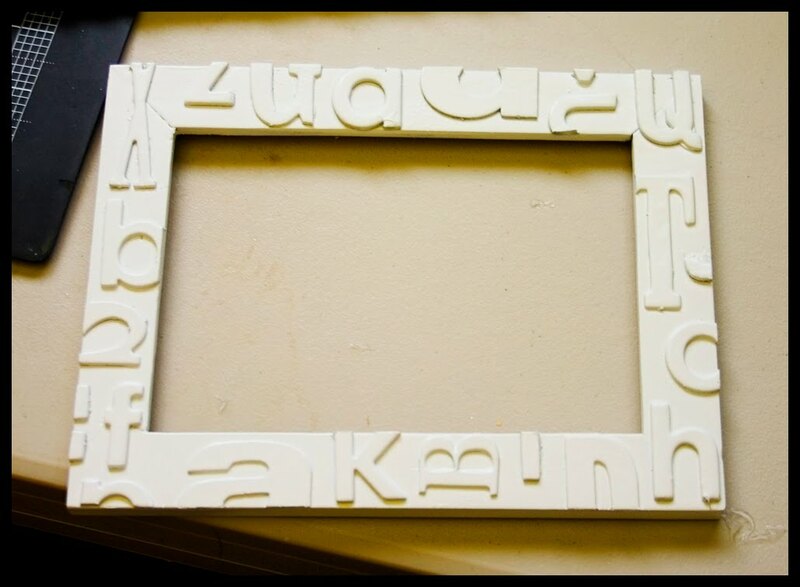 Step 6: Clean your glass and put artwork in your new frames. I designed these prints just for my kitchen. See, pretty simple and I such a fun look! Maybe someday I will do a chair. . . I LOVE THIS! I am going to have to do this! Very cute! Did you design the artwork, too? Oh my! I love these! Those frames are amazingly adorable!! I'm glad I found your blog!! These frames are wonderful! So much texture and the interplay of light and shadow, love it! I have those letters, too and I've got frames...gotta try it! So clever, so clever. The frames are fantastic... I have a school picture of my bubs that I needed a frame for and now I know what to do! Thx for sharing such a fab idea! What a great idea! I love the artwork inside, too! So cute. I am so in love with this! found your from sumos!